Fall is right around the corner, and that means all those fun times fishing, tubing, and partying on the boat are sadly coming to an end. Do you know what you’re going to do with your boat? How are you going to store and keep it safe for the cold weather that’ll be here sooner than you know? Don’t leave your unused boat to the elements. Storage keeps it safe and clean. Storing your boat in a storage unit might be the best thing during the months you are no longer using it. A storage unit can offer multiple benefits that can help prolong your boat’s life. Water Damage Protection: Even though a boat is supposed to be in the water, if it’s not being used it can suffer from water damage during storms. Storing your boat decreases any amount of water damage that can happen since it’s in a dry area. Security: Boats are expensive and desirable, making them targets for theft and even vandalism. Your boat is an investment, and it’s important to protect your boat and invest in a place that’s going to keep it secure. 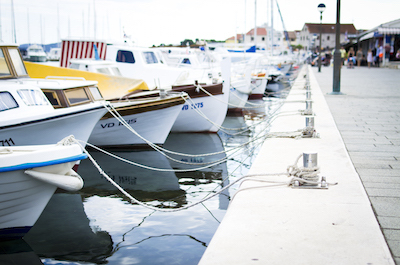 Storage units with 24-hour security can keep your boat safe and away from any potential theft or vandalism. Weather Protection: We all know of the importance of sunscreen. Just like the sun can damage our skin, it can damage a boat as well. Storage units can protect your boat from sun and heat damage along with protecting it from any other weather elements that can cause exposed portions of your boat to break down. Cleanliness: Deciding to store your boat in a storage unit can help keep it free from dirt, mold and mildew. It’ll also protect your upholstery from being ruined from weathering and other elements, keeping your boat in better shape for extended amount of time. When planning where and how to store your boat for the upcoming change in weather, it’s important to know your boat’s dimensions so you can find the right-sized unit. Summer was fun, but it’s time to start preparing for those colder months and protecting your boat from any potential damage it could endure. Tidewater Drive Storage Center offers several Norfolk storage units that can accommodate your boat. Contact us today for information on available units.